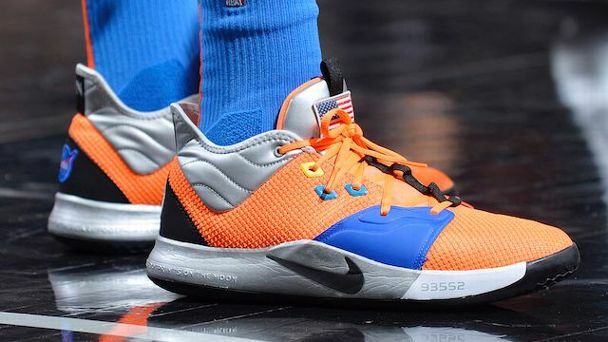 A week after his Oklahoma City Thunder teammate Russell Westbrook debuted his latest Jordan signature sneaker, Paul George had a debut of his own in store. Dressed in astronaut-suit-inspired metallic materials and fittingly team-friendly colors, his new Nike PG3 sneaker was unveiled in a detailed NASA theme, drafting off of George's longtime favorite inspirational mantra and his hometown connection to the government space agency. Just as PG was coming into his own as a prep player, the NASA Armstrong Research Center opened in Palmdale, California, inspiring the then-high schooler to set lofty goals for his path ahead. "Don't tell me the sky's the limit when there are footprints on the moon," he often said. Through the years, that became a charging call in his rise through the ranks of the league, and now it's featured on the midsole of his new sneakers. The PG3 features a variety of NASA-related touches throughout -- not just on this limited-edition launch colorway but on the design itself. The circular outsole traction pods are moon-crater-cued and designed to be more multidirectional for sudden shifts in any direction. George's Palmdale zip code, 93552, is highlighted along the midsole. As George and his team of Nike designers worked behind the scenes on the concept over the past 18 months, he toured NASA's facilities for added inspiration, and he took part in a series of physical and mental training sessions last offseason at the Kennedy Space Center in Orlando, Florida. Fully submerged underwater, with dumbbells in hand, he powered forward toward the pool's deep end while undergoing a series of breathing and calming exercises. "As I see myself getting older in this league, the question I ask myself is, 'How can I become a more efficient athlete?' I need to perform at the elite level I know I've reached but without wasting excess energy," he said. "At the end of last season, I knew I had to better control my breathing while I play, so I added underwater walks into my offseason training." For the first time, George will also be releasing his own signature tracksuit, backpack, shirts, hat and socks, with each featuring his home zip code and NASA design cues. Now three years into the signature process, he and the brand are starting to define the foundational elements of his series, establishing consistency across the line. The low-cut and sleek silhouette has become a staple of each model, while the two-way-facing Swoosh branding serves as a subtle nod to PG's pride in being a two-way player on the court. "It's really reflective of his game," designer Tony Hardman said. "When you look at LeBron, he's like a freight train when he goes up and down the floor. He's explosive and just banging on people. Paul is a lot more efficient and smooth in his movements. I always think that Paul is almost floating around out there. It's like an effortless attack." While George's NASA-themed kicks happen to perfectly sync up with the Thunder's uniform, Stephen Curry has shown a willingness this season to step more outside the box with the themes and colorways of the new Under Armour Curry 6 that he's introducing on-court. Styled in a flooded all red, the look of his sixth signature model still pays tribute to Oakland, California, as Curry hopes to give the place he has called home for all 10 years of his NBA career a proper send-off during the franchise's final season at Oracle Arena. The colorway is simply dubbed the "Heart of The Town," in a nod to the fans who have fueled the team's rise, as part of Curry's "10 in The Town" season-long campaign. "This is who we play for and what makes us the most proud of winning championships and bringing banners to the Bay," Curry said. "Seeing everybody in the streets celebrating after games -- we do it for our fans 'cause they are the heartbeat of what we do." Boston Celtics point guard Kyrie Irving has continued his string of strong themes atop his latest model, breaking out three pairs of the Kyrie 5 that each turned heads this week. In a follow-up colorway to his collaboration with Boston-based boutique Concepts, Irving rocked a limited "friends and family" edition of the "Ikhet" Kyrie 5 earlier in the week, with jade, black and gold tones. The shoe's theme takes inspiration from the all-seeing eye along Irving's Hamsa Hand arm tattoo and the Eye of Ra from ancient Egypt, a symbol of protection, power and good health. "What I love is that Concepts has always identified specific cultural touchpoints and pushed things that make them their own," Irving said. Elsewhere around the league, Spencer Dinwiddie continued to narrate his self-made K8AIROS SD8 signature sneaker, as the Brooklyn Nets point guard highlighted baseball pioneer and Brooklyn icon Jackie Robinson with a detailed and sharp hand-painted portrait. LA Clippers all-out hustler Montrezl Harrell turned back the clock with an original, China-exclusive pair of the Nike LeBron 7 from a decade ago, andNew York Knicks rookie Kevin Knox continued his strong play in a loud, orange pair of the Puma Clyde Court.